1. Uniqueness – Players practice the Holmes catch in practice. They practice the diving and dragging of feet to stay in bounds catch during the week. And you see this catch almost every week in some game during the season. There is no way to practice the Tyree on the helmet getting tackled holding the ball catch. That just happens in real-time… once in a blue moon. 2. Step by Step Drama – The Manning-Tyree catch had at least 3 instances in which the play should have died but somehow stayed alive. One, Eli was engulfed in a sea of pass rushers almost instantly as the play began. Two, as he tried to navigate out of the pile, some defender grabbed Eli’s jersey. Yet he managed to break free. Three, Tyree leapt to grab a catch that was almost over his head but he was able to get his hands on it. Four, Harrison had his arm inside Tyree’s arms and could have easily broken the play up. Five, somehow Tyree was able to keep the ball one inch from the ground as Harrison tackled him with their arms tangled. Wow. The Roethlisberger-Holmes didn’t have this same step by step drama. Roethlisberger had several seconds of safety before the pass rushers closed in, yet he didn’t feel the pressure that Eli felt. He lasered it to the back corner and luckily went through three defenders into Holmes hands. Great play but not too much drama. 3. Pressure situation – The Steelers and Roethlisberger had just won a Super Bowl a few years ago. Everyone expected them to win this one. Instead they let the Cardinals come back to take the lead in the fourth quarter. That means they finally played to their expectations on that last drive. However, the Giants were massive underdogs at the Super Bowl. They were playing against history, a vaunted team on the verge of going 19-0. Manning was a mediocre player before the playoffs and he stepped up majorly on that last drive. Plus, it was third down and without making that long play, the game was pretty much over. The Holmes catch was only second down, and even with a miss there, the Steelers still had two downs to laser it into the end zone. 4. Caliber of receivers – If you follow the Steelers, you have heard Holmes many times before. Although he’s the third receiver, he has been known to make some big plays before. He is easily a number two receiver on many teams. However, Tyree has only been known to be a good special teams player. He was way down on the receiver chart of the Giants and didn’t even play this year for the Giants (pseudo-injured reserve). He was definitely not the guy you’d expect to make such a big catch in the Super Bowl. 5. Where and when the play occurred – The Steelers were at the 6-yard line of the Cardinals. It was second down. Cardinal fans were already somewhat resigned to the fact that the chances were the Steelers would score a TD there. However, the Giants were in desperation mode. It was third and long and they were near midfield. As a Patriots fan, you’re tentatively happy at that situation that the chances of Eli making a first down there was against the Giants. When you look at these four reasons, they not only validate that Tyree’s catch was more remarkable but that the Giants-Patriots Super Bowl was better than the Steelers-Cardinals game this year. Last year was completely David and Goliath, fighting against history. While this year, albeit a great game, was not a greatly played game. Cardinals should have had the lead at halftime, if not for that stupid intercepted pass, can’t tackle for 100 yards play. As a Cardinals fan, you gotta be pretty upset that you played so well against the Steelers except for that halftime play and the last drive. As a Steelers fan, you gotta be relieved that you were able to pull it out on that last drive after losing a big lead in the fourth quarter. All in all a great game to watch, but it still didn’t compare to all that last year’s game signified and the suspense and excitement of it. As a disclaimer, I am a Giants fan. However, my second favorite team is the Steelers, so this article is not that biased. It was a great game, and the Steelers proved how great and respected the franchise is. They deserve to be called “America’s Team” instead of those sorry Cowboys. The Super Bowl should have been Steelers-Giants. Now that would have been an amazing game! Who is a better quarterback? Eli Manning or Tony Romo? Three words… Jeter versus A-Rod. This whole debate about who is a better quarterback, Eli Manning or Tony Romo, can be summed up with three words, Jeter versus A-Rod. One is quieter, more professional, goes about business, and wins when it counts. The other is flashy, puts up big numbers, all over the gossip news for questionable reasons, and has issues with winning the big games. In the end, who do you want on your team? The former, the one that wins when it counts. All the other stuff is irrelevant if he cannot carry the team when it counts. That’s why Jeter will always be revered by Yankee fans, and A-Rod seen as an outsider. 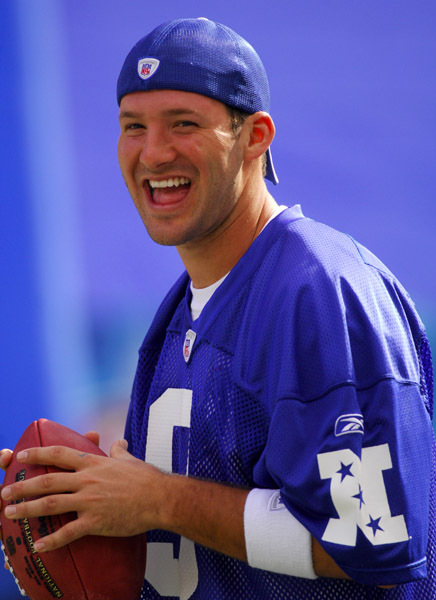 That’s why Eli will be loved by coaches more than Romo. In essence, just like A-Rod, until he carries the Yankees to a World Series championship and he is named the MVP or he makes an amazing play that is the catalyst for a championship, he cannot be compared to Jeter. Similarly, until Romo can carry the Cowboys to a championship, something that the team historically is good at, then he cannot be compared to Eli. Who cares how good he is in the regular season. It is a wasted season for the Cowboys anytime they make the playoffs and cannot win. Look at John Elway and Michael Strahan. Their legacies were completely solidified when they finally won championships for their teams. They were both integral parts of those teams. A championship win does tremendous things to the public perspective of the athlete and to the athlete himself. Before the Giants amazing playoff run last year, Eli was seen as a mediocre QB compared to Romo, and many others in the league. He was seen as someone who belonged in the NFL but would not be able to lay a finger on his much better QB brother, Peyton Manning. After Eli’s leadership and performance throughout the playoffs, and his 4-0 start to lead the Giants this season, many people now argue that Eli is a better QB than Peyton. What has changed so quickly? Well, for one thing that championship. 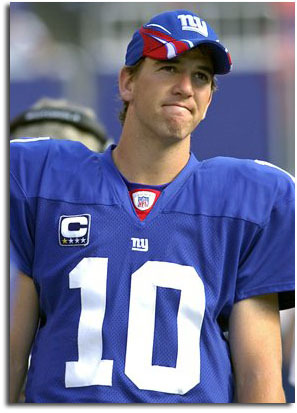 For another, Eli is a much more confident player. Athletes need confidence. When they start doubting their ability to do well, it will show up on the field. The elephant will simply grow bigger and bigger. One last thing. To say that the Giants easy schedule makes them undeserving of a 4-0 record and number 1 ranking is absurd. To say that Eli is doing well because he has played against horrible teams is absurd. Simple reasons. If it was that easy, then the Patriots should have gone undefeated last year at 19-0. If it was that easy, then the Cowboys should not have lost yesterday to the Cardinals. If it was that easy, the Redskins should not have lost to the Rams yesterday. The same team that Redskins and other NFC East fans ripped on the Giants for beating. If it was that easy, the Eagles should not have been so close against the 49ers until the end of the game. In the NFL, you have to beat the teams that you should be beat. Simple as that. Otherwise, you are making excuses. Note: The poll below has been “compromised” by Tony Romo fans trying to justify that he is a better quarterback than Eli Manning. The count before the “compromise” was 9-1 in favor of Manning. After the compromise, the count was 1005-9, in favor of Romo. So simply subtract 1004 from the Romo number (until another compromise occurs). I think most of us agree that Romo is a better quarterback, but until he wins some playoff games, he won’t be in the same class as Roethlisberger and Manning. I don’t even think Romo was drafted in any of the first few rounds, unlike the other two who were drafted in the first round. Note: Well, well, well, the Eli Manning fans strike back. His count was hacked on June 1, 2009. Please subtract 50 from his count. Eli has taken the lead though after Romo tied it up for a while. You would think that after winning the Super Bowl last season, all eyes would be on the New York Giants’ training camp this summer. Instead, it’s been the quietest camp in memory. You would think that everyone would be wondering which Eli would show up this season, the pre-playoff version of the past, or the efficient and accurate one during the Super Bowl run. Or if Plaxico Burress will be totally healed by the opener. Or how Kevin Boss is doing as the new go-to tight end. Or which of the exciting young receivers, Sinorice Moss, Mario Manningham, Dominic Hixon, Michael Jennings, would make the team. Or how excitin their backfield will be now that Brandon Jacobs, Derrick Ward, and Ahmad Bradshaw are all healthy. 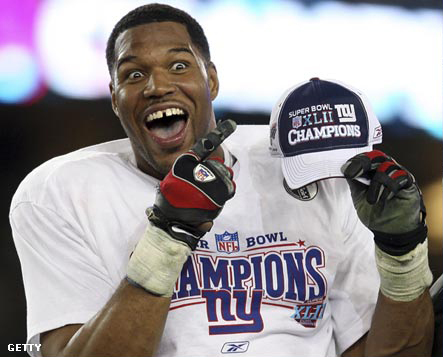 Or how the Giants are doing without their leader Michael Strahan. So, what is a Giants fan to do? Take hope in the Giants pattern of performance the past ten years or so. They always overperform when they are expected to do nothing. The most obvious one being the 2000 Super Bowl run. It was clear they were playing above their heads when they got killed by the Ravens. Last year was another example. The converse is just as true. They always underperform when they are expected to be Super Bowl contenders. As funny as it is, the public has such low expectations for the reigning Super Bowl champions. Mostly due to the reasons mentioned above, and also how every Super Bowl winner, minus the Patriots, have a hard time making the playoffs the next season. With low expectations this year, if the Giants continue their pattern of performance, they will do well this year. As for interest in the season, that will quickly change come the first game of the season when the Giants kick off the official NFL season in front of a national crowd on Thurs, Sept 4 on NBC against the Washington Redskins! It has been four months since Super Bowl XLII in Phoenix when the vastly underdog New York Giants upset the conceited New England Patriots. It has also been four months since (I think) the greatest play in the history of the Super Bowl, … when Eli Manning escaped four linemen to throw a desperate pass to David Tyree, who caught it with his helmet. That play was all anybody could talk about the week after. And it became the one unresolved issue from the Super Bowl. What do you call it? The Play? Taken. The Slip and Grip? Too long and gimmicky. Catch 42? Hmm, what about Eli’s escape? Phoenix rising? Again, what about Eli’s escape? Well, four months later, it still hasn’t been resolved, but I have noticed some of the big websites, such as nfl.com, all referring to it as “The Great Escape”. When I first heard this name, I thought well, it only refers to one-half of the play, Eli’s. But now, I kind of like it. In leaping into the air against the vaunted Patriots secondary and catching the ball with his helmet while Harrison had his arm in there is in itself a great escape. Plus, the way the Giants came back on that drive to sneak out a 17-14 victory is also a great escape. 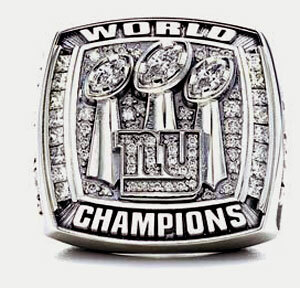 The Giants received their humungous Super Bowl rings a couple of days ago. Each ring cost over $25,000 to make, but Tiffany’s only charged $5000 for each of them? Why? Because they had a huge press conference with Tiffany logos all over the place. It was a good trade, expensive rings for cheap while corporation gets free advertising. Gotta love capitalism. In any case, the next day the Giants had their first OTA, organized team activities. The turning of the page to the 2008 season.. That means football is almost here!